If you are not already on our mailing list, enter your email address below. We send out alerts when new Harlan Ellison books are released. For the first time in 50 years, Ellison's second novel returns to print in a substantially revised and expanded form. Also included are three of Ellison's best long-form stories. 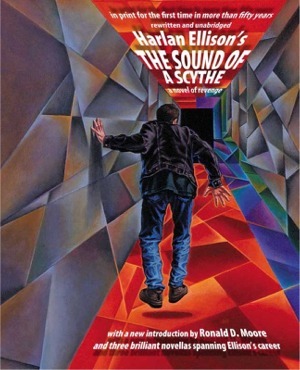 The Sound of a Scythe, Harlan Ellison's never-before-republished second novel—appearing for the first time under the author's preferred title (the original publisher renamed it The Man With Nine Lives without Ellison's consent)—expanded by 25% from its 1960 publication and extensively rewritten by Ellison for this appearance. Virtually every page has been finessed by the author. "Mefisto in Onyx"—The Bram Stoker Award-winning novel of a telepath who's asked by his best friend to journey into the mind of a serial killer on death row. "All the Lies That Are My Life"—Ellison's novella about a world-famous writer who overshadows his best friend from beyond the grave. "The Resurgence of Miss Ankle-Strap Wedgie"—A Veronica Lake-inspired tale of a rediscovered silver-screen star's brutal return to Hollywood. A new introduction by Emmy-nominated tv writer Ronald D. Moore, creator of the reimagined Battlestar Galactica and writer/producer of Star Trek: The Next Generation, Roswell, and HBO's critically acclaimed Carnivale. And a beautiful new cover by World Fantasy Award-nominated artist Jill Bauman.